This was the second annual awards poll run by RISCOSitory, along with a survey (results yet to be calculated), on the RISC OS Awards website. Although nominally for 2014, the period covered by the poll was actually from November 2013 until December 2014, allowing a small overlap with the previous poll, and a similar policy will be adopted moving forwards. The poll was also open for a longer period than the previous one, with the voting form online from the beginning of December 2014, and remaining live until a week into February 2015 - but despite this, fewer entries were received; around 100 this year, compared to around 150 for the 2012/13 poll. One possible factor in this was that while a series of nominations were presented in the previous poll, for 2014 the approach taken was to allow free-form text entry so that voters could nominate whatever they liked - or nothing at all if they couldn't think of anything. Perhaps unsurprisingly, this meant that no category received an entry from everyone who took part, so not only were there fewer entries overall, but the number of votes in the individual categories received was fewer still. More significantly, though, some people chose to fill in some categories with messages to the effect that they couldn't think of anything. This meant a little more effort to tally up the votes (blank fields were automatically filtered out - ones containing text had to be parsed) but that people chose to include those comments was telling: It suggests that it's possible that some people may have opted not to vote at all for the same reason. Despite any of this, however, as last year the whole process ran smoothly, from setting up the voting form, through to the way the votes were checked and counted, with the actual processing being done entirely on RISC OS after transferring the raw data off of the Windows computer on which it was received. Again, the counting process used a combination of a small program written in BBC BASIC (modified from last year because of the change in voting method) and Colton Software's Fireworkz. So, with that out of the way, the results of the RISC OS Awards poll for 2014 can be found below. Congratulations to all the winners. Twenty different products received votes in this category, with just over half receiving only a single vote. Only one product, however, managed to achieve a two digit number of votes - and it did so with ease. 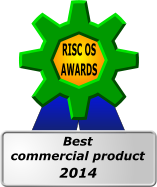 With 40% of the total votes, the best commercial product of 2014 is RiscOSM from Sine Nomine Software. RiscOSM is a vector-based mapping application, which uses data converted from OpenStreetMap. Twenty eight different products received votes in this category, and just over half received only a single vote. Again, only one product managed to achieve a two digit vote count. 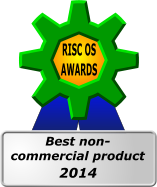 With 24% of the total votes, the best non-commercial product of 2014 is NetSurf, from the NetSurf Developers. The open source web browser continues to be updated on a regular basis and just gets better and better. One of the categories with the fewest number of votes cast, only thirteen different games received votes, and most of those received only a single entry. Once again, only one game received enough votes to reach double figures. With 60% of the total votes, the best game or diversion of 2014 is Star Fighter 3000. The game was originally developed by Fednet Software and is now maintained by Christopher Bazley, and was recently made available to download free of charge. The number of items identified in this category ranges from twelve to fourteen, depending on how they are identified - but irrespective of the method used, the organisation responsible for the best hardware of 2014 is the same. With either 35% or 65% of the total votes, the best hardware of 2014 is the Raspberry Pi from the Raspberry Pi Foundation. The Raspberry Pi is the cheapest means by which RISC OS can be run on native ARM hardware - an astonishingly low price compared to the typical prices at which Acorn sold their own hardware - making it a very popular platform. This category saw fifteen different suggestions identified, with not one of them achieving votes in the double-digits, and most only receiving a single nomination. With 21% of the total votes, the best new development of 2014 is the ARMX6 computer from R-Comp. The ARMX6 was first demonstrated to the public at the 2014 London Show in October, having been hinted at in a number of announcements for other products in the run up to the show. The big reveal came part of the way through R-Comp's theatre presentation. There were nineteen different suggestions identified in this category, and again none managed to reach two digits, with just over half receiving no more than one nomination. With 21% of the total votes, the best show of initiative for 2014 goes to R-Comp for developing the ARMX6. The computer had been in development over the course of the previous year, with a number of parties both here in the UK and overseas involved - the aim being to produce something solid, stable and reliable that could serve as a true replacement for the IyonixPC and RiscPC before it. There were twenty different suggestions in this category with, yet again, more than half only receiving a single vote, and just one reaching double digits, giving it a strong lead over all the others. With 46% of the total vote, the best website or online resource of 2014 is the RISC OS Open Ltd website and forum. RISC OS Open Ltd maintains and hosts the RISC OS shared sources, and the forum is the primary hub for discussion of its development and related matters. This category saw only eleven different nominations, two of which managed to reach double digits (with only another two receiving more than one vote). With 46% of the total vote, the best publication or offline resource of 2014 is Archive Magazine, from Abbey Press Glastonbury. Founded by Paul Beverley of Norwich Computer Services in 1987, Archive was taken over in 2007 by Jim Nagel of Abbey Press Glastonbury. The magazine now appears much less frequently, but remains an interesting and entertaining read. Another category with only a small number of different nominations, there were seven suggestions in this category, with only three of them receiving more than one vote, and the winner soaring ahead. With 62% of the total vote, the best foreign language resource of 2014 is the RISC OS FR website from David Feugey. The site is predominantly French, with an English section, and is served up from a Raspberry Pi running RISC OS. This category also saw just eleven different suggestions, with all but two of them receiving just one or two votes, and the other two leaving them behind. With 50% of the total vote, the best show or event of 2014 was the London Show, organised by the RISC OS User Group of London . The annual London Show is always popular, and this one saw R-Comp reveal their new computer, Richard Keefe selling beta versions of Impression-X, and much more. Twenty one different suggestions were made in this category, with two thirds receiving just one vote, and only one easily reaching double digits. With 40% of the total vote, the most innovative or interesting project of 2014 is development of the ARMX6 by R-Comp. RISC OS users were clearly impressed by the new machine, as well as the innovation shown by those involved in conceiving the idea and, over the course of the preceding year, taking the idea all the way through to a product. The result is R-Comp's third ARMX6-related win in the 2014 poll! With 21% of the total vote, the second best overall contributor in 2014 is Jeffrey Lee. And with 46% of the total vote, the best overall contributor of 2014 is RISC OS Open Ltd.